Get active with the kids! 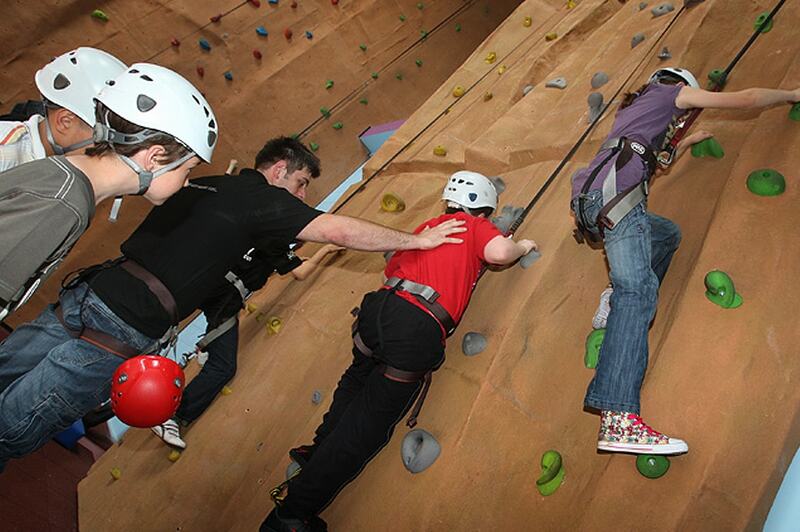 Our superb venue offers climbing action for all levels, including specific sessions for those under 6years! Recognised as developing both the body and mind, climbing offers an invigorating change to more conventional family activities. Our staff are adaptable and friendly, inviting the whole family to get stuck in! With two climbing walls and many different routes we are able to offer the challenge to suit you, whether climbing for the first time or seeking more of a thrill! Climbing gets the blood pumping and adrenaline flowing, it’s a fantastic opportunity for children as it builds self-esteem, inspires confidence and develops both social skills and team work. With a clear aim in sight, this leisure pursuit is both challenging and rewarding, whilst remaining essentially fun! For a 30 minute session, all equipment is provided. £4 (auto belays only) for a 15 minute session. Age, height and weight restrictions apply.